[prMac.com] Hagenberg, Austria - Ergonis Software today announced the release of Typinator 5, a major new version of their popular text expander. With a long list of new features and enhancements, Typinator 5 impressively emphasizes its role as the leading text expander on Mac OS X systems. The major new feature is doubtlessly scripting support, which opens up a wide range of opportunities to create more generic and versatile text snippets than ever. With a simple inclusion mechanism, text expansions can execute external scripts and include their results in the expansion. Typinator supports scripts written in in many different languages like AppleScript, Perl, PHP, Python, Ruby, and arbitrary shell scripting languages. Typinator has always been praised for its quality, speed, and robustness. A completely rewritten expansion mechanism and many internal optimizations take these attributes to a new level and lead to lightning-fast text replacement and unrivaled compatibility with arbitrary target applications. Typinator 5 supports date and time calculations and features a new pocket calculator, which lets you insert the result in various formats. Typinator is now a universal 32/64-bit binary and requires Mac OS X 10.5 or newer to make best use of current system architectures. "After two years of development and internal testing, we are proud to finally present the most versatile scripting solution for text expansions. We managed to make powerful scripts usable for everyone, even without programming knowledge," said Christoph Reichenberger, CEO of Ergonis Software. "And programmers can easily extend the scripting repertoire of Typinator with even more features like stock quotes, calendar functions, time zone calculations, clipboard manipulation, URL processing, dynamic signatures, context-sensitive code fragments. The possible uses are virtually unlimited." Guenther Blaschek, CTO of Ergonis Software, adds: "One of the best things of Typinator's scripting feature is its flexible technology under the hood. Parameters and persistent variables enable script developers to combine multiple scripts and communicate with Typinator in novel ways. These details open the door for many future extensions. We are excited about the new possibilities and can't wait to take Typinator to the next three or four levels in the next releases to come. Stay tuned for a continuing revolution in text expansion!" Typinator 5 requires Mac OS X 10.5 or newer and is fully compatible with OS X Lion. Typinator can be purchased securely on the Ergonis Software website. The upgrade to Typinator 5 is free for anyone who has purchased a license on or after June 1st 2011 as well as for anyone who is still covered by a previously purchased time-based license. 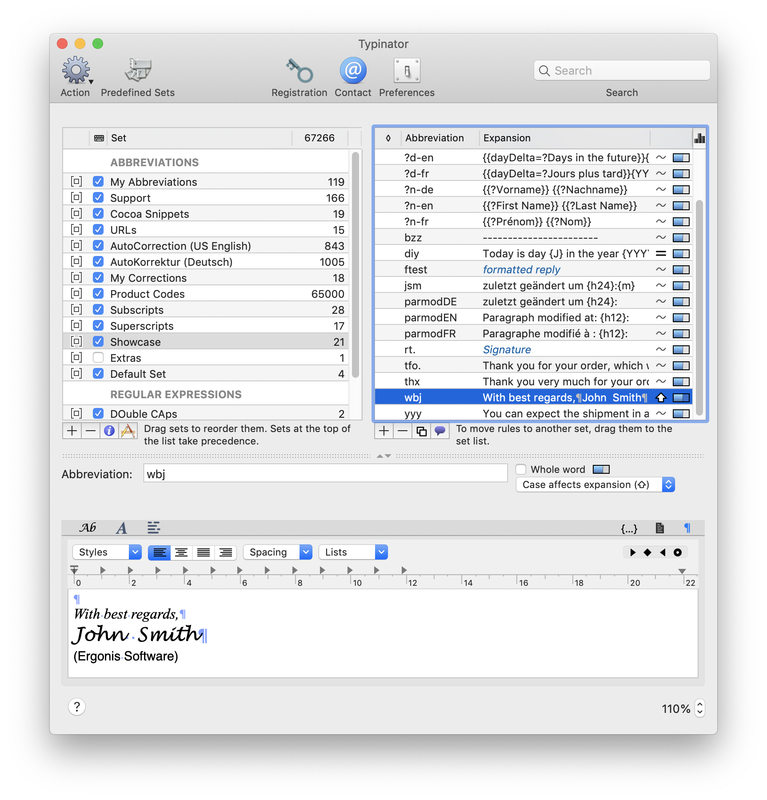 Other users of a previous Typinator license may upgrade to Typinator 5 for EUR 12.49 (single license). For information about purchases, including enterprise licenses, volume discounts, and upgrade pricing offers, see the company's web site. Instead of purchasing Typinator by itself, customers can get the Macility Productivity Bundle that also contains two of the company's other productivity tools, PopChar X and KeyCue. Headquartered in Hagenberg, Austria, Ergonis Software Gmbh is a privately held software development company founded in 2002. With a focus on innovation, Ergonis develops ergonomic and intuitive software that boosts the productivity of Mac and PC users alike. Copyright 2002-2009 Ergonis Software Gmbh. All Rights Reserved. Ergonis products are either registered trademarks or trademarks of Ergonis Software GmbH. Other company and product names may be trademarks of their respective owners.